Get ready for powerhouse printing at its best. This stylish machine features a 5-color ink system and a 4,608-nozzle print head that ejects precision droplets as small as 1 picoliter. The result? Amazing 9600 x 2400 color dpi resolution (max.) and wonderfully life-life color values, along with bold, laser-quality text. Plus, you can print a superb borderless 4" x 6" photo in only about 21 seconds. The two paper trays let you store both photo paper and plain paper, so you're always print-ready. Exceptional resolution: 4,608 precision nozzles create exceptional resolution-up to 9600 x 2400 color dpi. More nozzles = high quality. Exceptional detail: Microscopic 1-picoliter sized ink droplets produce exceptionally detailed photos. 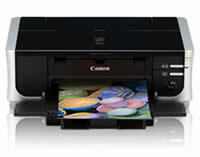 Vivid color, bold text: Four dye-based inks plus a pigment-based black ink deliver superb photos and laser-quality text. 4"x6" Print Speed: Borderless 4" x 6" photo in approx. 21 seconds. Print 2 sided: Print 2 sided—and save paper. 2 Way Paper feed: Built-in dual paper trays for quick and instant paper selection. Auto-Image Fix: The built-in Auto-Image Fix feature via Easy PhotoPrint EX helps you produce amazing results on all your photos. Snap and print: Print right from your infrared-enabled mobile camera phone! Click-Connect-Print: Just capture an image with a PictBridge ready digital camera/DV camcorder, then connect and print! Quick Start: Powering up your printer is now much faster. After pressing the power button, you can begin imputting commands quickly. This page is part of GeneralManual.Com Network Canon PIXMA iP4500 Photo Printer User Manual.